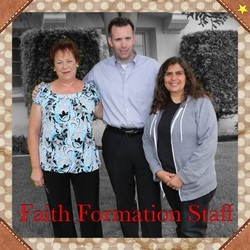 The Faith Formation Staff of St. Margaret Mary Parish welcomes you to our Religious Education (RE) programs. To serve with love - our faith Formation programs live out our goals to welcome, provide spiritual nourishment, foster peace and justice, and encourage service to others. Quick Links to each of or programs can be found below. Our mission is to deepen the students’ relationship with our loving, just and merciful God, to increase their knowledge of Faith and Church, to enrich their prayer practices and provide opportunities to serve the community. 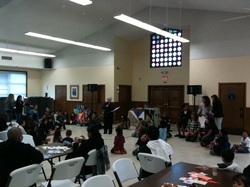 This is done primarily through classes, taught by Catechists, assisted by aides and parent volunteers. As your partners in the religious formation of your children, we strive to provide a welcoming, loving environment in which we can supplement what you are already teaching by your example. It is our desire to assist you in the spiritual as well as the educational growth of your child, and ultimately your entire family. It is through prayer and active participation in the sacramental life of the Church that we can grow together and ensure that our children learn what it is to know and live the gospel message of Jesus Christ. We look forward to getting to know you better and we invite you to be an active participant in RE programs as well as in the St. Margaret Mary Catholic Community. Every year we rely people just like you to pass on the faith. If you feel a call to help, please checkout our Becoming a Catechist web page. On behalf of St. Margaret Mary Alocoque Parish, it is our pleasure to serve the families of our Parish.